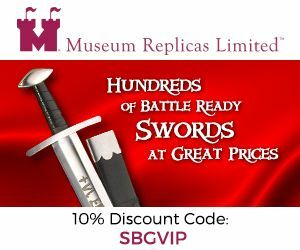 People that love it do so because it is a faithful replica of Aragorn's Ranger Sword and because the blade is so incredibly durable. But the most common complaint against it that it is HEAVY, and not just a little bit heavy, this thing is like a tank! 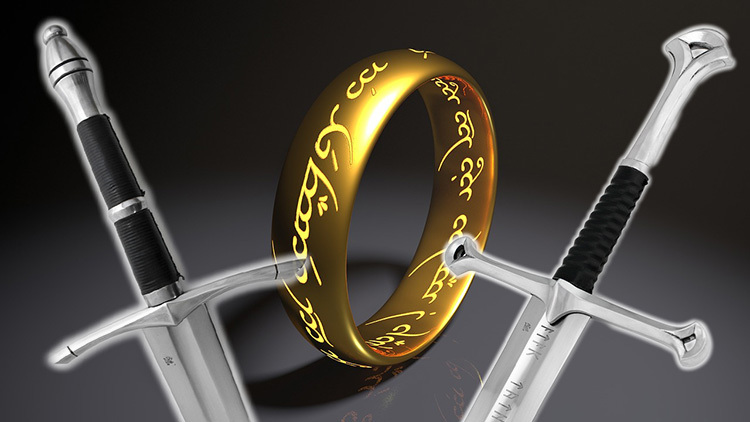 "The Lord of the Rings Ranger sword is a recreation from the popular trilogy written by J.R,.R. Tolkien. The Ranger is hand Crafted with 1060 High Carbon steel, tempered to a Rockwell of 53. The beautifully detailed leather handle is accentuated by a Ring, representing the Ring of Power. 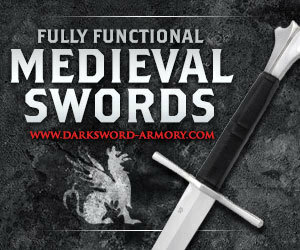 The blade is forged with a deep full length fuller and slightly curved quillions." I've been in love with the Ranger sword since first seeing it on Lord of the Rings. I've always dreamed of having it, but figured if I did, it would have to be a stainless steel, wall-hanger. Having gotten rid of nearly every wall-hanger, I wasn't keen about getting one. 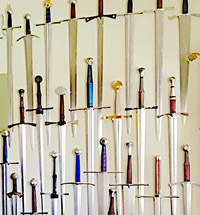 I did some research and was introduced, for the first time, to Darksword Armory. I couldn't believe someone was making such an accurate model to the films. 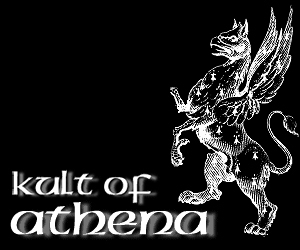 I did some further research on the company, and as did many others, found the forums that dealt with the apprentice dagger that didn't even survive shipping. I was immediately turned off of DSA. I was so disappointed when I read the review and thought I'd never find another accurate model. 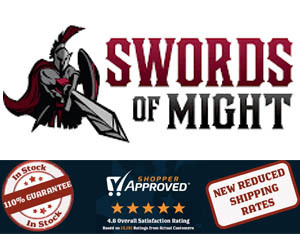 Well, fast forward about a year or two later and I came across the Sword Buyers Guide website, where I read the review of the Medieval Knight sword. I was so relieved when I read the review and the explanation behind the apprentice dagger. Having seen the review, my mind was at ease and I had to have one. The Ranger sword was received in a huge box and I knew the sword was going to be massive. It was tightly packed in the box with packing paper and the sword itself was tightly wrapped in cardboard, newspaper and plastic. There was a heavy coat of oil and the blade was in perfect condition. 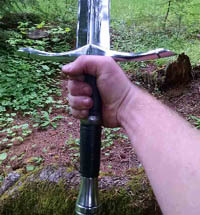 The hilt was big and very accommodating to big hands and allows for a good, strong grip. After removing all of the packaging, I was floored by the weight of this sword. It was the heaviest sword I have, with the exception of the Cold Steel Two Handed Great Sword; and the Great Sword didn't have that much weight over the Ranger. 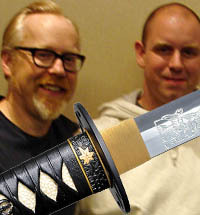 Regardless, I could feel the strength of the sword and knew it could deliver powerful blows and felt incredibly sturdy. This is one big sword and it would take a strong guy to wield this in battle for an extended amount of time; but the sword is truly awesome. The blade is big and heavy. 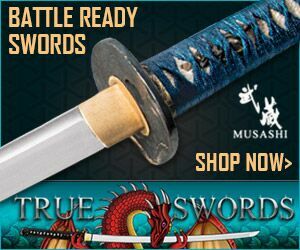 It's constructed of thick 1060 High Carbon steel and has a good fuller that nearly spans the length of the entire blade. The hammer marks are inconspicuous, but present. The blade is not whippy, but rather stiff and strong. The edge of the blade was delivered blunt and dull, but after a short time, had an excellent edge with the assistance of the handheld sharpener and a woodblock as a support. I kept one side dull, but will probably sharpen that side too. The grip is constructed of wood, covered in a black, leather. The leather is stitched on but is mainly secured with glue. 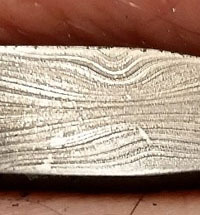 The grip also has a nice steel spacer at the center and is described as being a representation of the One Ring by DSA. The grip is simple, yet attractive. The pommel is closely modeled after the United Cutlery Ranger Sword, but is more rounded. It is constructed of solid steel and has two groves cut into it at the center. 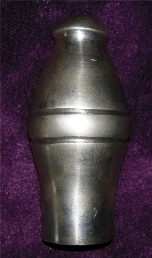 The weight of the pommel is 12oz and assists in the balance of the blade. If need be, the pommel could prove a formidable blunt, mace like, weapon. This is my favorite piece of furniture on this sword. The guard, spanning 10", provides exceptional hand protection and just looks amazing. With the guard slightly curved toward the blade, it allows the user to safely catch his opponents blade and stop it without worrying that it would slide off and injure the users' hands or wrists. The only difference I see on this guard compared to the UC Ranger sword is the lack of gold trim inlaid at the end of the guard at the groves. I prefer this guard to that of the UC model. Once again, this scabbard is simple in design. The scabbard is made of wood, covered with stitched, black leather (also glued on) and with a simple steel throat and chape. The throat is cut to fit the guard, but could be done a little cleaner. 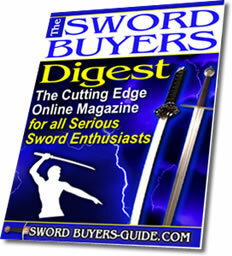 It's a freebie that DSA includes with the sword to protect the blade. 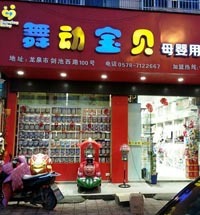 It could however be easily dressed up to look nice. I haven't decided what I'm going to do with mine yet, but I do want to do something to improve the looks. This is the most fun I've had with cutting tests. My buddy brought a sword of his over and I tested my DSA Ranger as well as the Elf dagger. After applying a good cutting edge to the Ranger, we decided to start with some watermelons and see how well it cut. My wife actually wanted to be first to take a swing at the watermelon with the Ranger sword. I figured it would be too heavy for her to swing correctly, but boy did she look good holding it! I was happy to report, she proved me wrong and made a great cut on the watermelon; cutting it right in half at its widest point! I was proud! I was up next and brought out another whole watermelon. After putting it on a wood block, I took my stance and got ready for the cut (desperately hoping my wife wouldn't show me up). The sword easily cleaved through the watermelon and was surprisingly easy to swing and manoeuvre. 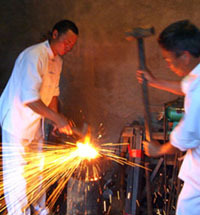 The weight of the blade does most of the cutting without much strength needed. I figured a tougher target was appropriate. The wood block was next. Now I do realize this is an abuse to the blade, but I figured it was a DSA sword and should be able to handle some chops at low to medium strength. 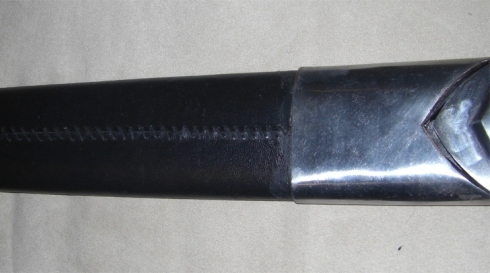 The first round of chops resulted in the hilt getting a little loose and was quickly fixed by removing the pommel and tightening the nut that was bolted to the tang. EDITORS NOTE: The Ranger Sword is now PEENED, which means that it cannot be taken apart - but also will stand up to many more impacts before loosening. If it does loosen, it can be fixed with a few hammer blows to the pommel. The chops were pretty good and didn't even phase the blade. This next set of chops were recorded and I used a bit more strength behind the blows, but only about medium strength. Once again, I placed this sword on a piece of 2"X6" and had to apply a lot of weight! There's no way I could have flexed the sword and taken the picture at the same time. With the assistance of my wife, I was able to get a couple of good flexes captured on camera. This was by far the hardest sword I ever flexed. These swords are insanely strong! 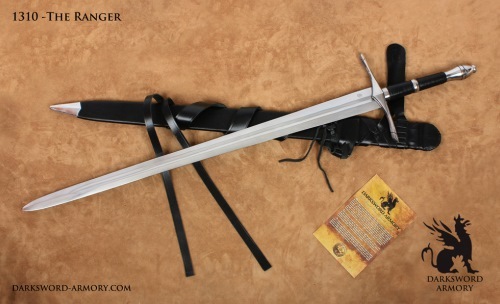 The Ranger Sword was discontinued in mid June 2014 and is no longer available to purchase. For another look at the new upgraded version, check out the video review below from JeeperRandy.